The red circle will be controlled by the player using directional keys.So for example if player presses right arrow, the circle will continue to move right till it hits a wall or player pressed left arrow. Circle will only move on path made using connections between the nodes. Here is the gameplay recording. 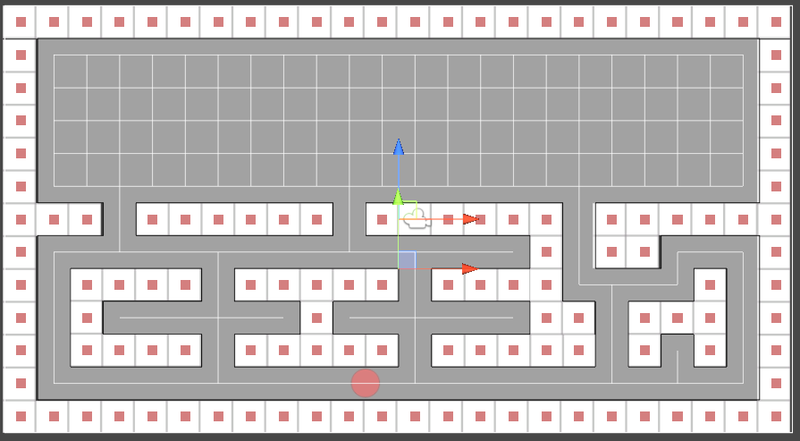 As you can see when player hits left arrow, Circle starts moving left in straight line but the when pressed up arrow, the generated path is not straight causing circle to behind the wall tiles. I am using provided Seeker and AI Path scripts to move the circle. and following lines to create new path when input is received. If you want the unit to only move along connections I would recommend that you use the AILerp script instead which does exactly that. Furthermore with the built-in movement scripts I would recommend that you use the ai.destination property instead of starting your own paths unless you really need to. Wow… Thank you so much for such a prompt reply and suggestions. Game now behaves exactly the way I intended. Great that it works well for you now!